The parks department has been listening to the public and their cries for more activities for historic downtown Milton and they are responding with the biggest concert schedule ever. In its fourth year, Bands on the Blackwater will be 19 weeks in total split over two separate sessions. 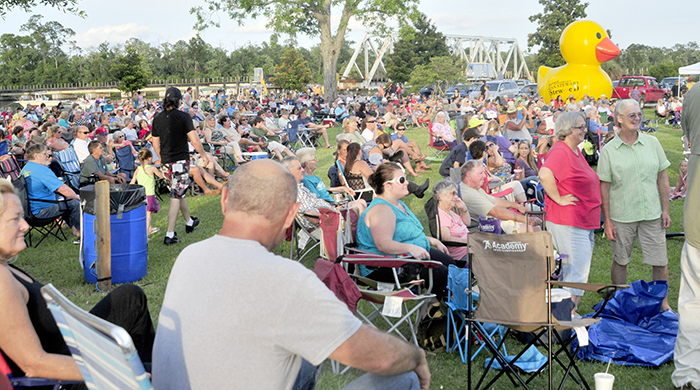 The first part of the concert series along the Blackwater River will start on April 10 and will be held every Friday night through the end of June. In announcing the first part of the 19 week concert series there are some familiar names and groups as well as some new bands preparing to take the stage in downtown Milton. On April 10th the season will kick off with Not Quite Fab, a Beatles tribute band with a sound very reminiscent of the music made famous by the Fab Four of John, Paul, George, and Ringo. Other groups and artists featured this year will be Santa Rosa County’s very own Chloe Channell, who appeared on America’s Got Taken, as well as the Dusty Sanderson Band from Nashville, Bring on the Benjamin’s, and the Highway 95A Band. After a short break the concert series will start back on Sept. 18 and will be held every Friday until Oct. 30. Once again all concerts will be held on South Willing Street in downtown Milton. The concerts start at 7 p.m. and end at 9 p.m.
You are invited to follow the City of Milton and this event along with several others on its Facebook page - https://www.facebook.com/BandsOnTheBlackwater. This page features updates on the bands, photos from previous concerts, and a lot of great information. Don’t forget it all gets underway on April 10 at 7 p.m., so bring your lawn chairs, family and friends for another great season of music in Milton with Bands on the Blackwater. April 10 – Not Quite Fab – This Beatles Tribute Band from Pensacola, Fla., who will help you can relive the music made famous by the Fab Four at the start of the British Invasion. April 17 – Déjà Vu - Déjà Vu have been delighting audiences with the right mix of showmanship and incredible musicianship since 2003 delivering a wide genre of music from modern country, R&B, and Classic Rock through today’s best hits. April 24 – Chloe Channell – The former America’s Got Talent contestant is the consummate performer who has opened for the likes of Tracy Bird, Rodney Adkins, Little Big Town, Craig Morgan, Ronnie McDowell, and the “Queen of Bluegrass” Rhonda Vincent to name a few. May 1 – CrossTown Band – The CrossTown Band has developed a huge following along the Florida Gulf Coast with a unique diversity and versatility from its members featuring a wide variety of music from classic rock, blues, top 40, county, and more covering the 1960’s to today. May 8 – 13th Hourglass –The Gulf Coast’s premiere band from the 60’s is reloaded and ready to rock by playing some of the old British Invasion style of music, Southern Rock, a little bit of R&B, and even some Seventies and Eighties Rock. May 15 – Chris Martin Band - Chris Martin is an up and coming singer/songwriter/guitarist from the Emerald Coast of Florida, featuring a special sound of “blue-eyed soul” mixed with a special “Nashville drawl”. May 22 – Dusty Sanderson Band - The Lamon Recording artists hail from Pensacola and have been entertaining thousands as the opening act for the likes of Lynyrd Skynyrd, Charlie Daniels, Travis Tritt, Rodney Adkins, Canaan Smith, John Anderson, The Kentucky Head Hunters, and countless others. May 29 – Category 4 - Category 4 is a band with classic rock roots but with a wide variety of musical styles mixed in such as Blues, R&B, New Country and much more. June 5 – Bring on the Benjamin’s - Bring On The Benjamins is a five-piece rock band playing inspired music from the ‘70’s to today. June 12 – Civilized Natives – The Natives are a band from the Gulf Coast playing venues like Paddy O’Leary’s, Bands on the Beach, as well as Bands on the Blackwater, by entertaining you with rock selections from the past 50 plus years. June 19 – Class X - Class X is old school classic rock band featuring high energy entertainment as they cover your favorites from the likes of Heart, Aretha Franklins, The Beatles, the Rolling Stones, and many more. June 26 – Highway 95A Band – The Highway 95A Band creates a party with pure American music that will have you dancing and singing along to every song.